Start Highway 431, 6.6 miles northeast of Highway 28 and 1.5 miles southwest of Mount Rose Summit. An area that looks like a small parking lot is located here though it is marked "no parking." The best word that describes Ginny Lake is secluded. It's also a short tour with most of the 1.4 miles to the lake being quite level, but there is a modestly steep climb in one area. At Ginny Lake your view is limited to the ridges that surround it. 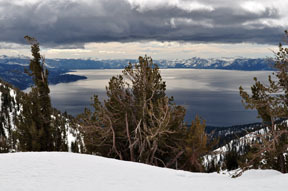 But a 0.4 mile extension to the south deposits you on a ridgetop with a grand view of Lake Tahoe below. This extension ups the intermediate tour to advanced-intermediate. From the trailhead (1) ski west on a snow-covered road for 0.4 mile until you reach the point where the road begins a sharp turn to the south (left) (2). 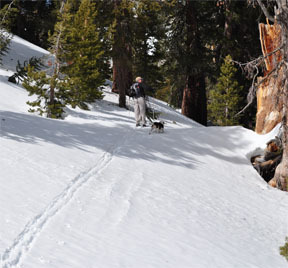 Turn north (right) onto a lesser snow-covered road and ski north and then west for a total of 0.1 mile until you reach Third Creek (3). The road disappears not far after you start this section. 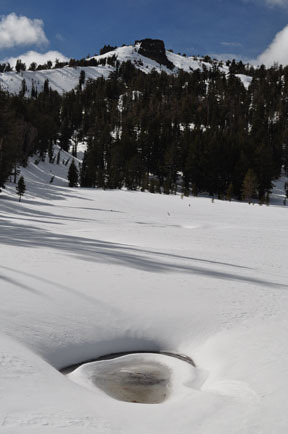 Cross Third Creek, then ski west and then into a meadow area for a total of 0.4 mile until you reach the west end of the meadow area (4). Crossing Third Creek can be tricky; search out a good spot. 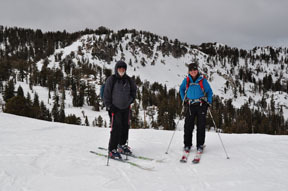 Climb west and then ski level through a meadow area for a total of 0.5 mile until you reach Ginny Lake (5). Retrace the route for 1.4 miles back to the trailhead (1). As an alternative you can extend the tour as described below. 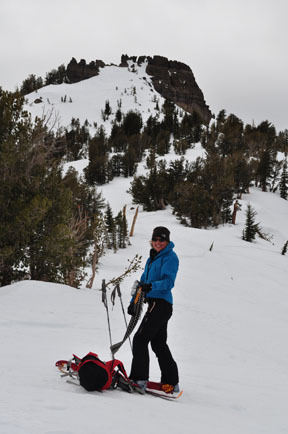 Climb south for 0.5 mile until you reach a saddle and ridgetop (6).